Well hey! aranDUMgametaser here with another hot hot movie improvement. This time around, I improve mmbossman's nearly 8 year old SM3 movie by 7109 frames via optimization, minor route changes, and better emulation resulting in faster strategies and a lot less lag. Spider-Man 3 is an interesting enough game, especially considering its source material. 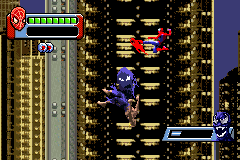 It uses the same engine as Ultimate Spider-Man for the GBA, but luckily removes most of that game's padding. Movement in this game is crazy fast thanks to a quirk in the game engine that lets Spidey preserve momentum if he does an aerial attack before hitting the ground. Combined with any form of web zip, and he can move at incredibly high speeds for long periods of time. Minor timesaves on the walls thanks to climbing diagonally, and also at the very end where I kill the guy with the key in a different way. Time saved on Green Goblin by hitting him onto the truck so his death animation starts sooner. Extreme optimization with the camera and wall climbs saves a few frames here. Time lost to the second train, since in Bizhawk it's unavoidable. mmbossman optimized the heck out of this level, so it's generally the exact same. Optimized the heck out of the second section to hit the switches as quickly as possible, saving a half second or so. Small bits of time getting enemy boosts and optimizing climbing. I saved about 100 frames on the limo section by killing enemies quickly enough that the limo doesn't lag. Small bits of time was saved getting the key quicker in the first section, and doing something completely different to hit the third and fourth cameras in the second section. Mild time saved on the route to getting the black suit. Saved about 4-5 seconds on Shocker by finding the quickest possible way to get him into the conductors. Minor time saves hitting the bombs and switches faster, and by getting some enemy boosts. Very minor timesave not getting stuck behind a box in the second section. Minor amounts of time saved reducing lag and optimizing climbs. Fun thing to note, you can end the first section by landing on the ceiling, which saves time. Saved time in the second section by getting my black suit meter up higher, which means I only needed to stop and hit one enemy instead of two at the end. The Bomber boss fight was optimized by reducing lag and getting him into positions to start his attacks sooner. New route at the very end saves a few seconds by having Spidey bypass the trains via damage, at the cost of not having the black suit for the first two phases of the Sandman boss fight, which wastes about 15 frames. Still, about a second saved on the last phase by stopping Sandman from attacking. Large amount of minor time saves in the first two sections, including an enemy boost, added up to about two seconds. 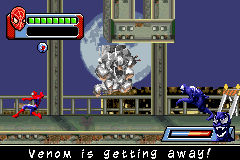 Venom was optimized by doing aerial kicks and uppercuts on him, which saved about 4 seconds in total. 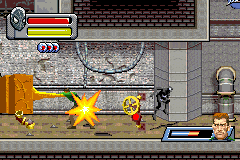 Additionally, I ended the Venom fight with him as close to the wall as possible, unlike the last TAS which required him to move all the way from the left side. This lets me knock him off the building as soon as its available. Mothrayas: Swift run and a good improvement. Accepting as an improvement to the published movie.